Gambhir received the award from President Ram Nath Kovind at the Rashtrapati Bhavan. There are couples from the cricketing fraternity in India who love to exchange their mutual affection and wit on social media. Ace opener Rohit Sharma and his wife Ritika Sajdeh are one of them. On Sunday, the fans saw yet another representative of the cricketing world, though a former, exchanging humour with his spouse on Twitter and the supporters loved the episode. It all happened after Gautam Gambhir, a former India opener, received Padma Shri from President Ram Nath Kovind at the Rashtrapati Bhavan on Sunday. The 37-year-old former cricketer from Delhi, who quit the game just a few months ago, was accompanied by his wife Natasha. The two later posed for the camera with the citation of the award in front of the iconic Bhavan with an ornamental cannon placed behind them. 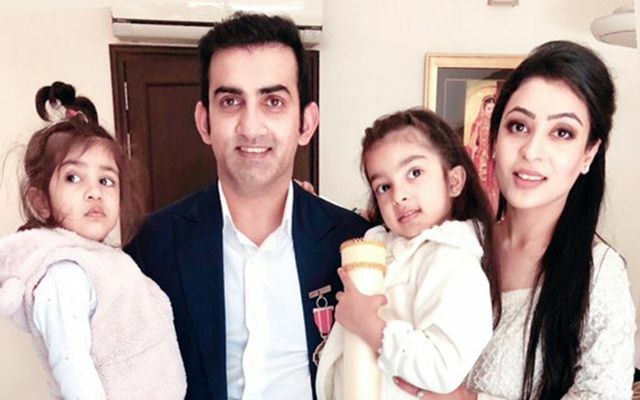 Gautam Gambhir later tweeted the photo with a witty caption trolling his wife and it was liked by the netizens. In the tweet, Gambhir asked his fans not to worry about the cannon placed behind for he is one who regularly gets fired at home. It was not difficult to understand who the target was. The tweet received almost 34k likes. Mrs. Gambhir was no less witty and she tweeted in reply to her husband uttering the old proverb: “Behind every successful man is a woman.” Her tweet too received over 31k likes. Gambhir, who scored a hundred in his final competitive game which he played against Andhra in Ranji Trophy this season, has had an illustrious career. He was part of two World Cup-winning squads (T20 in 2007 and 50-overs in 2011) and in both cases, he had played crucial knocks in the final that helped India win the title. He also earned a fair name in captaincy, having led India to 5-0 wins in international series and also leading Kolkata Knight Riders to bag two titles in the Indian Premier League. Known for his forthright views and philanthropic work, Gambhir scored over 10,000 runs in international cricket with 20 centuries.